Chaharmahal and Bakhtiari Province (Persian: استان چهارمحال و بختیاری‎, Ostān-e Chahār-Mahāl-o Bakhtiyārī ) is one of the 31 provinces of Iran. It lies in the southwestern part of the country. Its capital is Shahr-e Kord. It has an area of 16,332 square kilometers, and had a population of 895,263 in 2011. The history of the province is tied to that of the Bakhtiari tribe. The Bakhtiari tribe can be divided into two sub-tribes, Haft Lang and Chahar Lang with various territorial affiliations and they are the main speakers of Lurish language. As the name of the province dictates with the combining grammatical feature of "-o-" which is Persian for "and"; the other group of peoples in this ancient province are the Chahar Mahali's. These peoples and the Lur's live side by side and share almost similar customs. Very slight differences exist between them but most are almost unnoticeable. However, there is often quite a bit of intermixing of the peoples through marriage. 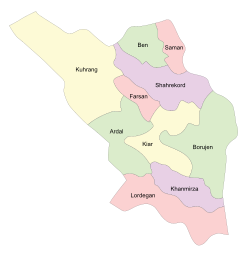 The cities of Shahr-e Kord, Broujen, Ben, Naafch and Saman fall in the Chahar Mahali area of the province and are generally not inhabited by Lurs. The Bakhtiari territories at times have also come under Isfahan and Khuzestan province. The people of this province have a history of having a simple living and being a capable people who are determined and effective warriors and fighters whenever circumstances made it necessary. They have gained such a reputation as being excellent, if not the best, horsemen in Iran. The people of this province, while having the more common Pahlevani wrestling/combat style of the deep-rooted traditional Zurkhane, which exists everywhere in all provinces, also have their own style of wrestling/unarmed combat as well (as do other provinces). The style is called jangi ("jang" means "war" and hence "jangi" "war-ish" or "warlike"). The province has various unique traditions and rituals relative to the 'tribal' lifestyles. Special forms of music, dance, and clothing are noteworthy. Bakhtiāri, which belongs to the Southwestern branch of the Iranian language family, is the province’s main language. Bakhtiāri is primarily spoken in the valleys of the higher areas in the western half of the province. It is also spoken in the lower areas around Lordegān in the south, and by speakers who have moved into the cities in the north-east. In the north-east quarter of the province, people in most cities and villages speak either Chārmahāli (also in the Southwestern branch of Iranian) or Turkic. Chārmahāli is transitional between Bakhtiari and Persian varieties of Esfahan Province, but more similar to the latter. Chārmahāli varieties spoken in cities include Dehkordi (in Shahr-e Kord), Ghafarrokhi (in Farrokh Shahr), Heysheguni (in Hafshejān), and Borujeni (in Borujen). There are also many other varieties of Chārmahāli spoken in rural areas. Most types of Turkic spoken in this province are similar to Qashqa’i of Fars Province, but they are transitional to the Āzarbāyjāni (Azerbaijani) language of north-west Iran. The Chārmahāli and Turkic language areas overlap with one another, and in the foothills of the Zagros and in the larger cities, they intermingle with Bakhtiāri as well. Tehrani-type Persian is now being taught by parents to children as a first language in some parts of the province, with the highest concentrations in the cities. The Atlas of the Languages of Iran (ALI) published a series of language maps for Chahar Mahal va Bakhtiari Province, including a point-based and polygon (area-based) language distribution maps, and several linguistic data maps. Written descriptions of some of the Bakhtiāri varieties in the province and a lexicon of the Bakhtiāri language have also been published. The province is mainly active in the agriculture sector. Most of the industrial sector is clustered around the center of the province. The province has the potential to become a vibrant tourist attraction because of its natural resources. ^ a b c Taheri-Ardali, Mortaza, Erik Anonby, et al. 2015. Language distribution in Chahar Mahal va Bakhtiari Province, Iran. http://iranatlas.net/index.html?module=module.language-distribution.chahar_mahal_va_bakhtiari. In Erik Anonby, Mortaza Taheri-Ardali, et al. (eds.). 2015-2017. Atlas of the Languages of Iran. Ottawa: Geomatics and Cartographic Research Centre, Carleton University. Online address: http://iranatlas.net (retrieved December 3, 2017). ^ Anonby, Erik, Mortaza Taheri-Ardali, et al. (eds.). 2015-2017. Atlas of the Languages of Iran: Chahar Mahal va Bakhtiari language map. Ottawa: Geomatics and Cartographic Research Centre, Carleton University. Online address: (retrieved December 4, 2017). ^ Anonby, Erik, Mortaza Taheri-Ardali, et al. (eds.). 2015-2017. Atlas of the Languages of Iran: Languages of Chahar Mahal va Bakhtiari Province, Iran. Ottawa: Geomatics and Cartographic Research Centre, Carleton University. Online address: (retrieved December 4, 2017). ^ Khosravi, Abdol’ali. 1996/1375. Guyesh-e Bakhtiāri: Ketāb-e chahārom [Bakhtiari dialect: Fourth book]. Esfahan: Nashr-e Ghazal. ^ Tāheri, Esfandyār. 2010/1389. Guyesh-e Bakhtiāri-ye Kuhrang [The Bakhtiari dialect of Kuhrang]. Tehran: IHCS Press. ^ Madadi, Zohrāb. 1996/1375. Vāzhehnāmeh-ye zabān-e Bakhtiāri [Lexicon of the Bakhtiari language]. Tehran & Esfahan: Enteshārāt-e Āyāt. Wikimedia Commons has media related to Chaharmahal and Bakhtiari Province. This page was last edited on 7 April 2019, at 18:15 (UTC).